At 5-a-side.com we typically like to keep things fairly light, but when we learned of the extraordinary set of circumstances surrounding two football tournaments that has led to an EDL march this coming bank holiday Monday (26th April) in Luton, we decided we needed to share the story. Before we go on, we want to stress that this website has no affiliation to any organisation mentioned in this article, or elsewhere. We’ve chosen to bring you the facts on this matter, and no view of any person or party mentioned in this article (or that might appear in the comments section below) represents an opinion held by ourselves. We’d rather have shin-pads not politics, ‘tekkers’ not trouble, and Astroturf not arguments – make goals not war, man. Lastly, we categorically abhor any form of racism or violence. There’s going to be a protest – which all began over a 5-a-side football tournament! The story begins with the tragic circumstances of two-year old Amelia-Mae Davies, who approximately one year ago was diagnosed with neuroblastoma, a rare form of cancer. Unable to receive treatment in the UK, her family nobly attempted to raise £250,000 for her to receive treatment in the USA. Sadly, the brave Amelie-Mae never received this treatment, passing away on 5th July 2013, half-way through reaching her funding target. Her brief but brave life touched so many people and the many articles published on her passing are a clear indication of the lives she touched in such a short space of time. It’s impossible to read the sort of tributes that have been paid to her whilst keeping a dry eye. That her name should have to be connected in any way with the events that have later unfolded is, quite frankly, a disgrace and something that all parties will have deep regret about. What has unfolded is no tribute at all to the life of such a precious child – everyone, no matter your views, should surely agree on that. The English Defense League, referred to as the “EDL” (Wikipedia link for those who want to read further on them), chose to raise funds for Amelie-Mae some time ago. Before her passing, the EDL had raised £5,798.87 for cancer charity NCCA UK to help Amelie-Mae, funds which were reportedly rejected by the charity who chose not to accept the fees on the grounds of remaining politically neutral. After Amelie-Mae passed away, the EDL continued to attempt fundraising efforts, hatching the idea to hold a 5-a-side tournament in Luton (the EDL’s founding location and base). They had planned to hold this tournament on the August Bank holiday weekend, on Sunday 25th August 2013. Rejection E-mail as retreived from Tommy Robinson’s (EDL Leader) twitter feed. The rejection appears to have led to much resentment by the EDL’s leader, Tommy Robinson, among others within the organisation. It must be said, however, that this resentment has not been directed at the 5-a-side centre, but rather at those who chose to complain to them about the tournament. A couple of days after the Amelia-Mae tournament had been cancelled, the EDL’s outrage seems to have grown at the discovery that the same 5-a-side centre is hosting another 5-a-side tournament on Monday 26th August, the very day after they had planned their own tournament. 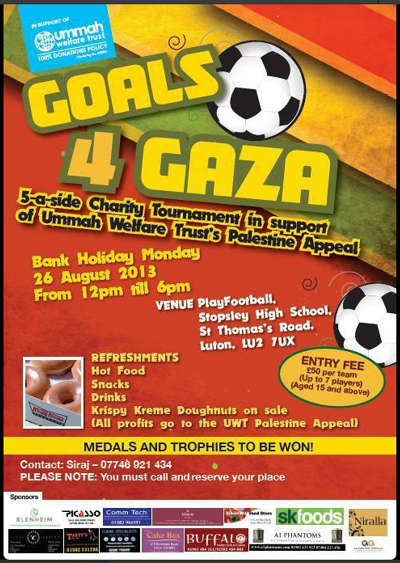 Goals 4 Gaza is another charity tournament; this one supporting the Ummah Welfare Trust‘s Palestine Appeal. It seems that the EDL were already on a collision course with somebody over the perceived injustice at the cancellation of their tournament, but this discovery appears to have sealed the decision, with the EDL’s leader declaring it to be ‘unfair treatment’ and also indicating that the charity benefiting from the Goals 4 Gaza tournament may support Palestinian fighters and therefore terrorism (again, remember, the EDL leader’s views not ours – we’re just reporting this stuff). Now, whether the idea for the Goals 4 Gaza tournament came before or after the Amelia-Mae tournament, we cannot tell for sure – although we note that the twitter account of Goals 4 Gaza did only open on 8th August – after the EDL received their rejection on the 29th July. On the other hand, the 5-a-side centre has apparently held tournaments for the same charity three years in a row. Whatever the circumstances, the EDL have decided to coincide a march- yes, that’s right a march– with the tournament in Luton on 26th August. 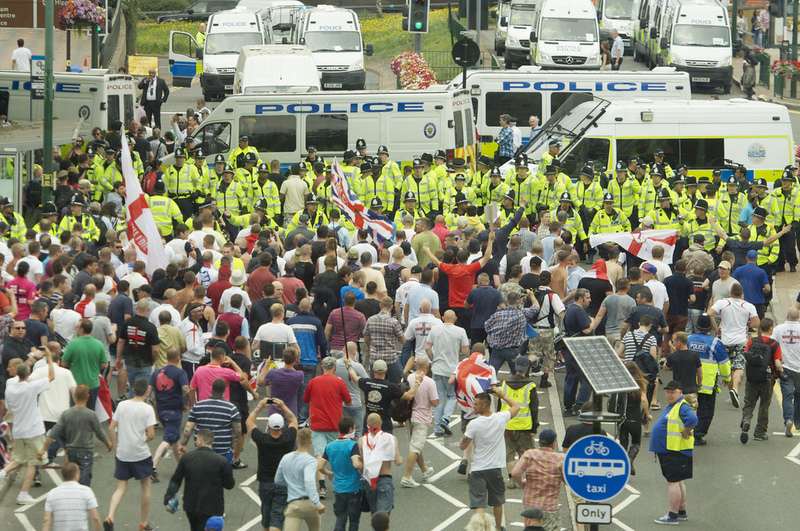 As at the time of writing there are no suggestions to say that the march is going to be cancelled – it seems to be have been discussed with the police and to be taking place (see Luton Today article: “Residents’ fears over EDL’s plans to march at charity event“). We wish EVERYONE in the Luton area well this bank holiday Monday and hope that this passes peacefully and without incident. And then after that can we all just get back to just enjoying some 5-a-side, please? So there it is, the story of how a row over two football tournaments has caused an EDL Protest in Luton this bank holiday Monday. Who would have thought that the game we all love would be tangled up in such a strange turn of events? However, let’s not lose sight of what began all of this, the story of Amelie-Mae. The saddest thing of this whole sorry affair is that her name has been linked with all of this squabbling. 5-a-side.com was touched by the story of Amelia-Mae and the author of this post has made a donation to NCCA UK, who continue to do incredible work to battle Neuroblastoma in the UK. Neuroblastoma is a childhood cancer; the most common cancer diagnosed in the first year of life, and responsible for an appalling 15% of cancer deaths in children. If you have been touched by Amelia-Mae’s story and wish to do something constructive to help, you may donate on their website, or also see the Amelia-Mae Davies Neuroblastoma Foundation who are also helping raise funds and awareness in memory of their daughter. Both the march and the football went peacefully. Goals 4 Gaza raised £7,975.50 according to their JustGiving page. The EDL gets a raw deals because its the front of a very obvious raciest movement! I am a white british male, as is my family and i proudly oppose them at every oppetunity. They pray on the uneducated and uninformed, and this latest attempt at PR is horrible. How dare they try and gain support off the back of a tragic set of circumstances! I’m not an EDL supporter – I’ve just tried to write it as it is and let everyone else make of it what they will. Thank you for your comment – have a good bank holiday weekend. At last the people are starting to see what the religion of peace are about, Peace , yes bombing and killings done by them, and when that fails just intimidate all around, The cause was a non political, thing , for a little girl,,and of course the islam extremist must be bowed to , as they have been doing for many year..this is a little thing, but that is the true nature of islam,,intimidate to control..Lest we forget the killing of Lee Rigsby, and his killers said on camera, it was for islam,,and it starts with a 5 aside.football game, But do you see how the gaza people have slipped in…the EDL have been trying to point out the Jihadist ways, for the last 3 years, after the spitting at our soldiers,coming thru the town from Afghanistan..like Tommy or not, the boy has guts, and in fact, is a great guy, with a big heart..Goals for Gaza, on the other hand are a group with Islamic connections ,what we dont know about…..
What a complete farce! this is a miscarriage of justice if I ever saw one! people are afraid to stand up to muslims and buckle every time they get offended by small petit things! Good on the EDL for actually standing up for whats right, this is OUR England, this is OUR culture, this is not an islamic country. They need to understand that and mind their own business.!! uaf ,mdl and hope not hate, the media paer//tv..
Hasd the 5-a-side centre stood its ground and let the EDL charity match go ahead, it could then have hosted the Goals for Gaza match the next day with the minimum of fuss. Ordinary people of all backgrounds have always suffered from Jihadis in Luton, but it now appears they’re targeting children with cancer who are given donations by groups they dislike. I don’t want to comment on the rights and wrongs of it all, but let’s be aware that the centre was under massive pressure from all parties. I feel sorry for them. It seems to be a case that the EDL tournamant was cancelled on the grounds that the venue had fears over threats made by those who oppose the EDL (no prizes for guessing who – threats by the so-called ‘Religion of Peace’?) and so chose to cancel the EDL event. Now the same venue is willing to host a tournament being organised by an Islamic group supporting Palestinian terrorists, and are puzzled why the EDL (and most right-thinking Luton residents) are up in arms over the issue?